Capacity (fl.oz): 14.6 – Very sturdy pans, high quality will not easily bend or crush. 107 Pans w/100 matching dome lids. Perfect for pot pies, pastries, sweets, and much more. Made with high quality American sourced aluminum which is 100% recyclable. Simply use and discard. Proudly made in the USA. OU Kosher certified. Widely used by restaurants, bakeries, caterers, and chefs across America. 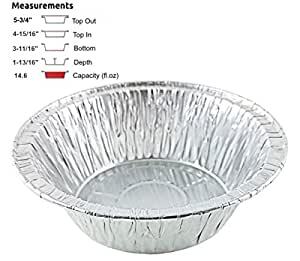 Premium quality 5 3/4″ disposable aluminum foil pot pie pans. These pans are extra deep (1-13/16″ vertical depth). Made with sturdy recyclable aluminum foil from American sourced materials. Proudly made in the USA.